There is no need to panic if the name, address, photo or any other details have been entered on your Aadhar card. You can cure all these wrong details in the Aadhar card. There is no charge for changing these details. You can also correct these mistakes by yourself. 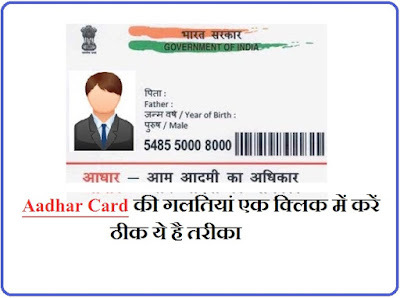 The way the Government has instructed to link the Aadhar with everything, Aadhaar card has become necessary for everyone. If any incorrect details have been entered in Aadhaar card, then we will not be able to validate our Aadhaar card. In such a way, the mistakes of Aadhaar card can be corrected by just one click at home. After this, enter the base number of your 12 digits and click on Send OTP. Keep in mind that this OTP will come from the Aadhar card to the registered mobile number. Now enter the received OTP and click on the log in button. One the OTP is inserted, a page will open, change any data you need to change in it. After that you have to upload a document for that changed data. Assume that you have changed your address, you will have to upload an address proof document for whatever address you enter. After uploading the document, you must select BPO Service Provider. After selecting the service provider, you will be told that your details will be updated within so many days. You will also get confirmation message and mail for it. This way you will be able to easily correct the mistakes recorded in your Aadhar card. 0 Response to "How to Can Correcting of Aadhaar Cards"